Thanks to Lobsang Sangay la and Jamyang Norbu la, the Kalon Tripa race has its first Sarah Palin incident. Palin, of course, is the defeated 2008 U.S. vice presidential candidate who supposedly said she had foreign policy experience because she could “see Russia” from her house in Alaska. That gaffe was taken somewhat out of context to criticize the half-term governor for her perceived weakness; in her case inexperience. As readers will be aware, Norbu asserted that Sangay stated that he wants to be the “Obama of China.” To some observers, this paraphrase might suggest that Sangay is over-ambitious or that he lacks political judgment. While the “Chinese Obama” issue has generated heated debate, the editors of The Tibetan Political Review (TPR) believe that a battle of sound-bites does not contribute to a well-informed electorate. Therefore, in order to fight oversimplification, we set out to determine what exactly Sangay actually said. It is our hope that the facts will encourage voters to examine the candidates’ policy positions rather than rely on sensational sound-bites. Sangay’s response to Norbu was that his “Chinese Obama” comment “was a JOKE and not meant to be taken seriously.” Based on our research, this is true. However, in investigating the issue, it also became apparent that a more important issue is being overlooked that is not a joke; namely, Sangay’s proposal for Tibetans to integrate into the Chinese society and political system. Moreover, Sangay has not yet presented this viewpoint to Tibetan voters. Voters should decide for themselves whether or not they agree, but the issue should be addressed. The event at which Sangay spoke was a panel discussion at the Woodrow Wilson Center, a think-tank in Washington DC, on October 27, 2008 (eight days before the election victory of Barack Obama). The topic was “China’s Tibet Policy in the Aftermath of Last Spring’s Unrest.” Sangay suggests that Norbu check the facts with event participants. Fortunately, an even more reliable source is available. A TPR contact provided an audio tape recording of the event (a partial transcript is available here). Sangay’s speech then discussed in detail how minority representation in the U.S. political system has been increasing, while in China there are basically no “minorities” (including Tibetans) in power at the national or even regional level. He also discussed the Chinese constitution and laws regarding minority rights and autonomy, arguing that China should enforce its own laws. Sangay’s approach is unique. It transforms the Tibetan struggle from one for freedom and self-determination, into one for civil rights and “representation in … government.” It differs from His Holiness’ Middle Way vision, which is for a distinct and internally autonomous Tibet able to preserve its unique culture and identity. In contrast, Sangay’s proposal lays out a vision in which Tibetans (like African-Americans in the U.S.) are given equal rights as Chinese citizens, and become integrated into the social and political system of the People’s Republic of China (PRC). This equality would then, in theory, allow an ambitious Tibetan to dream of being elected president of a democratic China. We agree with Sangay that China should treat its “minorities” better and that all Chinese citizens should have equal rights under the law. However, minority rights in the U.S. versus China are not analogous. Tibet’s history and status are very different from that of African-Americans in the U.S. The PRC does not just discriminate against minorities on civil rights; it also marginalizes them by increasing the number of Han Chinese in ethnic minority areas. The U.S. minority population is growing and stands around 25% of the total population as of the 2000 census, distributed throughout the country. In the PRC, the minority population is less than 10% of the population, concentrated in certain geographic regions. Additionally, Sangay’s views expressed at the Woodrow Wilson Center do not account for the Chinese tendency to look down on non-Chinese peoples or cultures (“Han chauvinism” “大汉族主义”). It also does not account for most Tibetans probably not wanting to become Chinese or be seen as Chinese. Perhaps most troubling, Sangay’s proposal does not account for limiting Chinese migration into Tibet. If China were to treat Tibetans like the U.S. treats its minorities, then Tibet would have no right to limit the number of Chinese who settle in Tibet. There is no “African-American autonomous region” in the U.S. That would mean that Tibet becomes an integral part of China, with unlimited Chinese immigration. This would, in fact, be the opposite of the Middle Way’s goal to create a Tibetan political entity where Tibetans can control their own internal affairs. Despite these gaps, it is logical to assume that Sangay has thought through this plan, because it forms such a prominent part of his speech. Does Sangay then accept Tibet integrating politically into the People’s Republic of China, because this is a prerequisite for a Tibetan to become president of China? Why broach the idea of a Tibetan leading China, unless the concern is simply with securing equal rights as Chinese citizens? Does Sangay also realize that any Tibetan who is president of a democratic China will need the votes of 1.3 billion Chinese more than the votes of 6 million Tibetans? We would like to know why Sangay has not presented this position directly to the Tibetan voters. Certainly, Sangay’s approach is unique enough to merit discussion so the voters can make an informed decision. Voters are entitled to an explanation from Sangay of a proposal he apparently made only in the context of a Washington DC think-tank. Sangay’s position is also in tension with the position that he tends to express to Tibetan audiences. 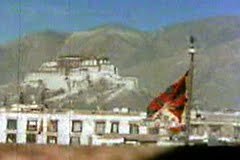 For example, Sangay has written in Phayul of wanting to “witness the unfurling of our national flag… on the rooftop of the Potala Palace.” Such a sentiment may be widely shared among Tibetan voters, but it does not appear compatible with Sangay’s proposal of Tibetan integration into China. The question, therefore, is: why does Sangay present one position to an audience of policy-makers in Washington DC, and another position to an audience of Tibetan voters? The “Washington DC Sangay” is the Harvard-trained lawyer transcending nationalism, urging Tibetans to join the Chinese system and demand equal rights as Chinese citizens. The “Dharamsala Sangay” is the Harvard-trained lawyer who is still a Tibetan Youth Congress activist at heart. Although he does not say so, perhaps Sangay simply believes that Tibet’s political integration into China is a “third choice” if independence and autonomy prove impossible? If so, this is a position that he has not yet presented adequately to the Tibetan voters. As it stands now, political integration appears incompatible with the “Potala flag” scenario. We would appreciate Sangay explaining this apparent discrepancy, and clarifying precisely where he stands. 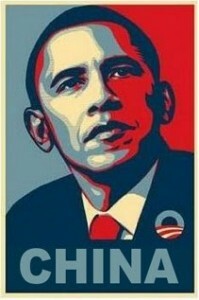 President Obama is a proponent of telling voters not just what they want to hear, but what they need to hear. Obama has put his faith in voters’ ability to understand nuances at times even when it has cost him politically. We hope that Sangay similarly avoids political posturing and double-messaging, and trusts the voters to evaluate objectively his entire set of proposals. If it were not for Norbu’s article about the “Chinese Obama” comment, it is entirely possible that Tibetan voters would not be in a position to ask these questions. But we believe these are questions that must be asked. Sangay would do himself and the voters a service to clear things up. We formally invite him to respond in this forum. Any candidate has a right to their views, but the voters also have a right to evaluate the whole candidate and not to be presented a half-picture. The voters should ensure that they have thoroughly examined all sides of any candidate they consider supporting; we strongly hope that the Tibetan media will take the investigatory lead in this effort. Finally, voters may be curious whether Sangay actually claimed he wants to be the “Obama of China.” In our view, it does not matter much compared to the above questions. Sangay claims this was “a JOKE,” which it clearly was. On the other hand, Sangay’s joke reflected themes that ran throughout his main speech. So it is reasonable for Norbu to place a certain emphasis on it. Carlson’s remark reminds us that Sangay has drawn parallels between himself and Obama during the Kalon Tripa debates. We do not think this serves Sangay’s campaign well, because we do not believe he does himself a favor by inviting the contrast between his record and President Obama’s. 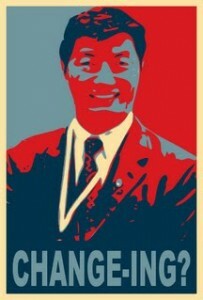 Rather, we encourage Sangay to campaign based on his own substantial record, of which he should be proud.